Is there anyone else out there who’s kids wake up Christmas morning and ask for breakfast BEFORE they open their gifts? Nope? Okay, well mine don’t either. So how about spending a couple of minutes to put this Crock Pot Breakfast Casserole together and let it cook while you can relax and open gifts with your kids and finally get the pictures you have been meaning to take the last couple of years? 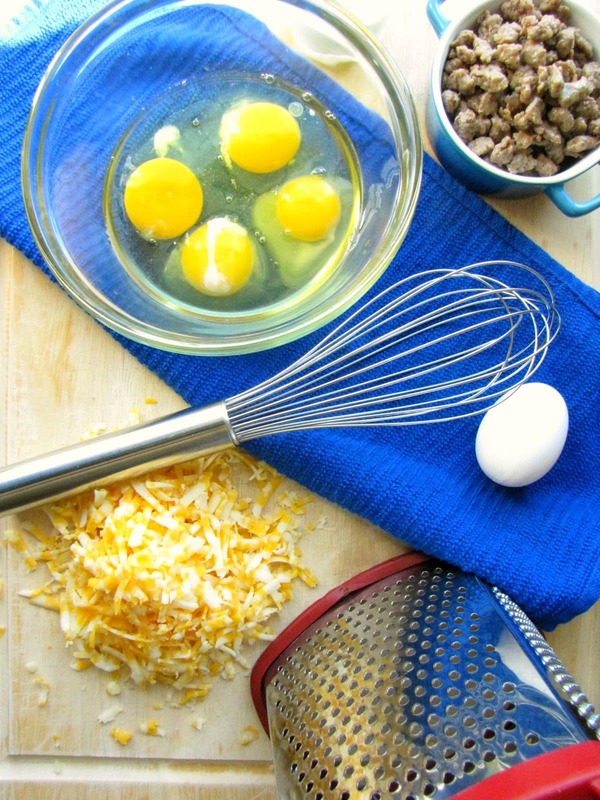 Just a few ingredients to assemble and your house will smell amazing! The crescent roll layer is flaky and buttery and the eggs are so fluffy. 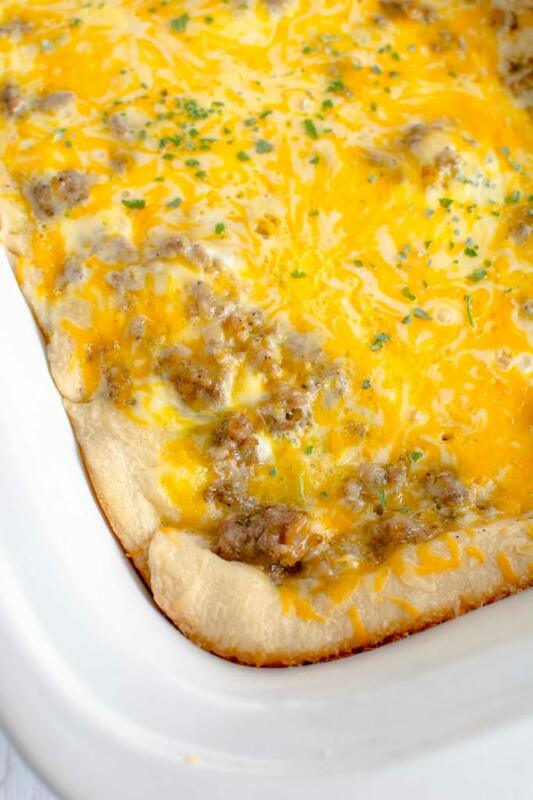 Add your favorite kind of sausage (spicy or not so spicy) and top with plenty of cheese. It’s all done when the bottom starts to brown and the eggs are set. 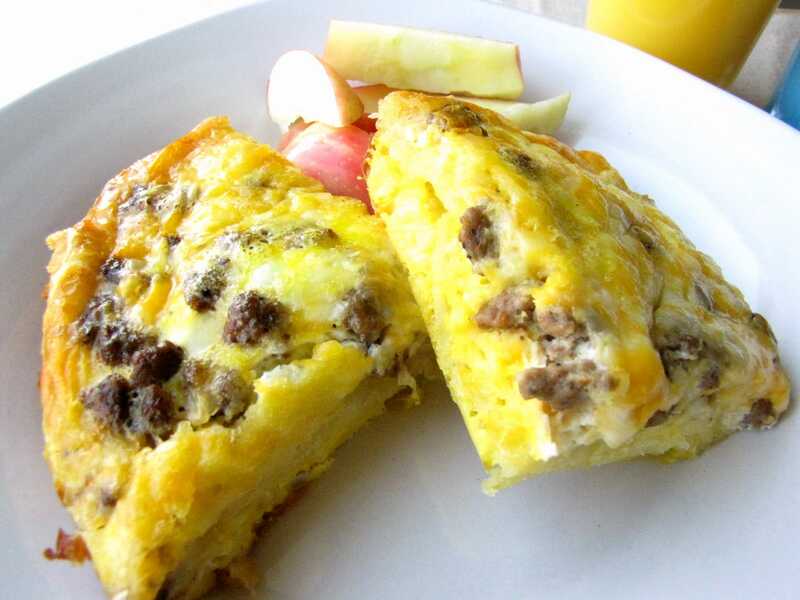 Serve it up with some fruit, juice and coffee and it’s a meal the whole family will love! Also, make it in a Crock-Pot Casserole Slow Cooker! Every recipe I tried has been wonderful! Each recipe has such a unique flavor, it is like a party in my mouth!! I am always recommending and sharing the recipes with everyone I know! if I could give 1000 stars in ratings I would ! Awww thanks! You are too sweet! Love it! Can you cook it on low? If so, for how many hours? Yes, your crust may not crisp up quite as much but you can cook it on low for 4-6 hours until eggs are fully cooked and crust is lightly browned. Can you double or triple this recipe? Would like to try it for my Bible study tomorrow. Thanks in advance! I think it would be tough to do as I used a 6 qt crock and could only fit one roll of crescent dough. But if you have more than one crock you could make several batches! I served this when my husbands aunt and uncle were staying with us…. so I would say 6 easily, possibly even 8 if you serve it with fruit or another side. How big of a crock pot do you use? I used a 6 quart oval crockpot for this recipe. Tried this for house guests this morning! It was a big hit! Will definitely keep this recipe close at hand. I used a bulk hot breakfast sausage knowing we like hot! Wow! Will also try with bacon. 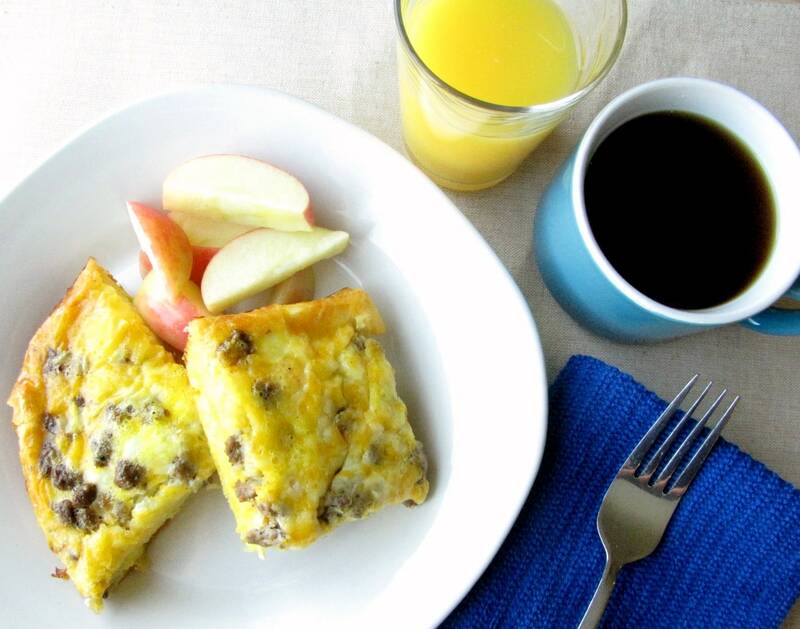 Thanks for this simple, tasty breakfast casserole! You’re welcome!! Thanks for letting me know how it turned out! Jennifer! I am so excited about this!! I can’t wait to see and taste all the recipes you include here!